Early California Function & Form: New Acquisitions on View Now! A grand cabinet and elaborate fireplace surround made between 1876 and 1878 for what was then James Claire Flood’s newly built mansion in Menlo Park, south of San Francisco, has arrived at the Crocker. Made by Pottier and Stymus, one of two top American furniture makers of the 19th century, the “Flood Room” is among the finest examples of its type in the United States — and one of the best preserved. Called Linden Towers, Flood’s Italianate mansion was made possible by the fortune he amassed through silver mining. He was one of four men in the “Bonanza Firm,” a business partnership that dealt in silver-mining shares and controlled and ran Comstock mines, most notably the Consolidated Virginia Mining Company. To decorate Linden Towers, Flood commissioned the prestigious New York design and cabinetmaking firm of Auguste Pottier and William Stymus, which executed some of 19th-century America’s top interiors, including decorations for the White House Cabinet Room under President Ulysses S. Grant. For this commission, Pottier and Stymus created a monumental exhibition cabinet of wood, chased bronze, and rouge-griotte marble — a piece that is approximately 15 feet wide, 15 feet high, and ornamented at the top with life-sized carvings of children holding animals. Meant for a dining room, the cabinet features other hand-carved surfaces related to food and dining, such as pineapples, pomegranates, ears of corn, and hunting scenes. Silver mined from the Comstock Lode is applied to the glass cabinet doors. Sitting across from this cabinet is a magnificent fireplace flanked by winged griffins, their outstretched wings supporting the mantel and their feet crushing the heads of devils — an appropriate metaphor for a fireplace. A large mirror graces the mantel, which itself is crowned by a carved, life-sized child holding a bird and olive branch. Tile, bronze, rouge-griotte marble, and various woods are used throughout. Aptly complementing this and the cabinet are exquisitely carved walnut door and window casings, along with wainscoting. The Flood family entertained many dignitaries in this room until Mr. Flood’s death in 1889. Linden Towers was dismantled in 1934, but fortunately the Pottier and Stymus furnishings were sold to prominent San Francisco attorney Walter Linforth for his nearby home. Linforth added a room to his home to showcase these pieces, and they have been there since. Recently, the current owners of the Linforth home, Neil and Jan Rasmussen, decided to sell the property and gifted the Pottier and Stymus furniture to the Crocker. 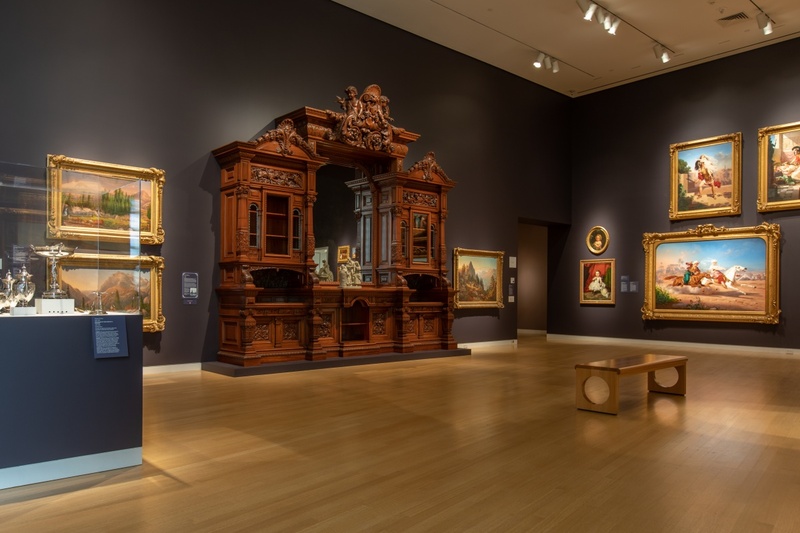 The furniture is now on view in the Museum's 3rd-floor Early California gallery, flanked by paintings from the 1870s and 1880s. Though painting in California has a rich visual tradition extending from Spanish settlement, sculpture did not come to the forefront of artistic expression until the late 19th century. At that time, Arthur Putnam and Douglas Tilden emerged as the first California sculptors to be celebrated at home and abroad. Putnam is best known today for his animal subjects, especially pumas. Born in Mississippi, Putnam spent his early years in Nebraska. His interest in art and appreciation of animals began when his family moved to a ranch in San Diego County. From there, in 1894, he moved to San Francisco to study at the Art Students’ League; he also studied sculpture privately. Following his marriage five years later, he settled in San Francisco. In 1905, he traveled abroad and was influenced by the sculpture of Auguste Rodin, who later called Putnam the greatest animal sculptor in the world. In 1916, Putnam’s sculpture became part of an important civic project when the city of San Francisco installed 327 new street lamps along Market Street from the Ferry Building to Castro Street, a stretch known as the “Path of Gold.” The lamp standards bore Putnam reliefs of the “Winning of the West” in three ornamental bands, depicting pioneers with ox‐drawn covered wagons, seated pumas, prospectors, and American Indians. Relatively few of the original street lamps survive, but Susan Westerberg Prager and Jim Prager recently donated one of the originals to the Crocker. The Pragers purchased the standard at auction, located a matching glass and shade, and then had the lamp restored it to its original appearance. Standing almost 10-feet tall and weighing 1,200 pounds, it now stands in the Crocker’s galleries, representing the work of a premier early California sculptor and San Francisco’s role in America’s City Beautiful movement.